ROUND ROCK, Texas - The Texas Rangers announced today that left-hander Brad Mills has been granted his release from the organization in order to sign a contract with the Orix Buffaloes of Nippon Professional Baseball's Pacific League. Mills joined the Rangers after being claimed off waivers from the Los Angeles Angels on March 24, 2013. The left-hander was originally drafted by the Toronto Blue Jays in the 2007 MLB First-Year Player Draft out of the University of Arizona. Mills has spent the entire 2013 season with the Express, compiling a 7-5 record and 3.87 ERA (97.2 IP/42 ER) in 18 games (17 starts). While with Round Rock, he was named to the Pacific Coast League All-Star team, but withdrew from the game after reaching an agreement with Orix. Mills started the season 6-0 before suffering his first loss on June 11 vs. Albuquerque. Since his last win on June 21, Mills has lost four consecutive starts, raising his ERA from 2.97 to 3.87 after his final appearance with the Express on July 13. He was tied for the team-lead with seven wins and had logged a club-best 97.2 innings of work. With this move, the Express roster sits at 23 active players with one major league rehab. 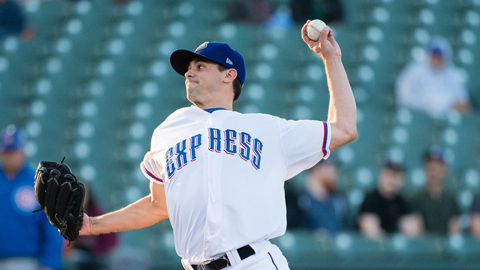 The Express opens a four-game homestand tonight against the Iowa Cubs at 7:05 p.m. Round Rock will send right-hander Alexi Ogando (0-1, 10.50 ERA) to the mound for a major league rehab start while Iowa counters with Guillermo Moscoso (7-5, 4.07 ERA). The Original Thirsty Thursday returns to Dell Diamond tonight featuring discounted draft beers and $1.00 sodas. For more information on the Express, visit www.RoundRockExpress.com or call (512) 255-2255. Keep up with the Express on Facebook and Twitter!